CPSIA - Wingnut or Dingbat, You Make the Call! Hey, it's her words - is Deborah Blum a "wingnut" or a "dingbat"? In her blogpost from earlier today, Ms. Blum takes Inez Tenenbaum to task for her sins in not clamping down HARDER on American businesses stupid enough to continue selling children's products. Ms. Blum is apparently a journalism professor at the University of Wisconsin. As an aside, I must say I had the mildest twinge of sympathy for Ms. Tenenbaum after I read Blum's blogpost. This is not my usual emotion when thinking about the CPSC Chairman, but heck, there's no winning for her, is there? I don't want her job. Hey, Ms. Blum, I can answer that one - YOU are the wingnut. She confuses CPSC lead recalls (according to her, 289 since 2001 - "more than 30 recalls every single year") with lead injuries. Hysteria over the POSSIBILITY of injury without bothering to assess the PROBABILITY of injury is how we got into this mess in the first place. I am sorry Ms. Blum is so easily rattled but isn't the data on injuries relevant? I have documented one reported death and three unverified injuries from lead in this period of time. Should we turn our lives upside down to reduce that risk further? This only amplifies my call for a National Xanax Fund. She reasons from headlines but shows little mastery of the actual facts. She cites the recall of McDonald's Shrek glasses ("McDonald’s recalled more than 12 million “Shrek 3″ glasses contaminated with the toxic metal cadmium (and also a little lead)") but fails to note that the CSPC has acknowledged in WRITING that the glasses were safe. She also cites the AP's recent report of lead and cadmium in enamel baked on certain glasses, but fails to note that the AP also admitted that the health risk was low or that the presence of these heavy metals is LEGAL in enamels of this type. Congress did that, and how could we EVER doubt Congress?! Ms. Blum repeats the junk science notion that if lead is bad in some cases, it MUST be bad in all cases. She absurdly compares lead in enamel with lead in drinking water, and then asks why there aren't standards to protect adults from the dangers of lead in enamels. Ms. Blum, can I see your turnip truck? Ms. Blum plays the China card, a jingoistic line of reasoning used by blamestormers. We make many of our products in China, and I consider this kind of finger pointing a contemporary form of racism. I have a lot of experience with Chinese sources, and have good reason to trust our trading partners. Ms. Blum regrettably has no idea what she is talking about when she blames "China", as though we all buy from the government of China. We do business with other privately-owned companies, not "China". It may make the world seem less complex to equate "cheap" with "poor quality" or "dangerous". It is not accurate, however. If the Deborah Blums of the world get the upper hand in this regulatory mess, they will solve the lead problem, I am sure. It won't be a solution you will like, nor will it be effective. Lead was here before Deborah Blum roamed the Earth and will here after she's gone - it's an ELEMENT, after all. No law can banish it, and no economy can survive if lead must be eliminated in all forms from all products, even in unharmful trace amounts. She will succeed, however, in killing off all companies that make children's products. That will solve the "problem" she is apparently obsessed with, but will create other, more serious ones. Let's hope we don't continue to slide down this slippery slope led by people who can't decide if they are wingnuts or dingbats. It's a tough call, I'll admit. She might be both. CPSIA - Save "Lost Souls", Vote for the Slanderbase! The semi-religious mission of the safety zealots was on full display in today's New York Times. In an article entitled "Deep Divisions as Vote Nears on Product Safety Database", the Times profiled the controversy of the pending public database final rule approval (due on November 24th in a rubber stamp Commission session), highlighting the idealist objectives of the database supporters. As per its typical leftist slant, the Times article gives scant credence to the legitimate concerns of manufacturers or the demonstrable consequences of the unrealistic Utopian vision underlying the CPSIA. After all, we manufacturers only care about money, right? Every drama needs a hero, villain and victim. The public database controversy has all the right elements - manufacturers and Republicans as "villains", consumer groups and Democrats as "heroes" and consumers as "victims". Positioned this way, why would anyone ever support manufacturers? Who would want to even listen to the black hats? Hmmm. Good strategy, Naderites! The implication that the database is necessary to protect consumers is not a well-examined assertion. There is already a lot of data available to consumers. For instance, the CPSC maintains a massive national injury database called NEISS. A search of crib injuries on the NEISS database for 2009 (classes 1543-1545) reveals 572 reports which extrapolates into a national injury estimate (for 2009 ALONE) of 16,537 incidents. - CHILD FELL 3 FEET OUT OF CRIB AND LANDED ON TILE FLOOR. CRIED IMMEDIATELY. D:CHI, FOREHEAD HEMATOMA. - PT FELL WHILE TRYING TO CLIMB FROM HIS CRIB. LANDED ON L SHOULDER ON THE FLOOR. FELL 4 FT. CRIES WHEN PICKED UP UNDER ARM. - PT FELL OUT OF HER CRIB AND STRUCK HER HEAD. NO LOC. CRIED IMMED. NOW ACTING NORMALLY. Did you learn a lot from this information? Can you verify that it's true? Can you see ANY issues with attaching (unverified) product identities to this unverified and uninvestigated data? Are you a plaintiff's attorney? "Some folks are worried more about lost sales and not worried enough about lost souls." Mr. Adler's POV makes the question of having a federal database a moral imperative. Wow, now that's a heavy decision - souls are at stake! Furthermore, Mr. Adler positions those who support the database as moral people and those who oppose it as immoral money-grubbers who prize financial well-being over the safety of consumers. Ugh. I would hate to be a Republican Commissioner voting against the final public database rule with Mr. Adler's curse hanging over my head! Ouch. Catching on to the theme, Ami Gadhia of Consumers Union, chimes in: "It’s a slow death . . . . [The] information never gets out in the public.” [Emphasis added] Death . . . souls . . . database! Do I hear a new slogan??? Apparently, testimony at a CPSC hearing is meant as an outlet for venting, not for listening. That's "abundantly fair", we are assured. Makes you wonder what "unfair" might look like . . . . If ever-disingenuous Rachel Weintraub is saying that we Americans have a "great deal" because we enjoy the protections of the Bill of Rights and other Constitutionally-guaranteed rights protecting groups and individuals against persecution and excessive governmental power, I agree. I agree heartily - and don't want to lose those essential legal protections that form an important basis for our investments. Please REMEMBER, everyone loses something when ANYONE loses their legitimate legal protections. Btw, Bob Adler is a lawyer and a former Scholar in Ethics and Law at the business school at UNC Chapel Hill . . . .
"Mr. Adler, the Democratic commissioner, said the database was not meant to be a legal forum like a court but more like a catalog of consumer experiences. He noted that a disclaimer on the database said the commission did not guarantee its accuracy. ‘"I put my baby in a diaper and my baby developed a rash." That goes up. It’s an early warning system to alert other consumers,' Mr. Adler said." Ahem: "But Ms. Nord said the proposal remained far too vague. She cited the recent case of Pampers Dry Max, made by Procter & Gamble, in which thousands of parents asserted that the diapers were causing their babies to get a rash. A commission investigation found no link between the diapers and the rashes. 'We would have posted all these complaints about them even though they proved to be wrong,' Ms. Nord said." Any idea why the CPSC "must" put up such a controversial database? The zealots know that there is legal risk in hosting a database that may include erroneous information or information that might slander manufacturers or tortiously interfere with commerce. They know this might violate manufacturers' legal rights and could lead to lawsuits - and don't want the legal liability or the hassle. How to get the data and avoid the legal problems? Get the government to host the legally-dubious information! Clever - but not necessarily in the interests of consumers or American markets. Is the CPSC supposed to provide Mr. Adler's catalog of "consumer experiences"? Is that part of its mission? [Readers of my blog know that] I realize we have a right of Freedom of Speech (check out the Bill of Rights), but is the federal government really supposed to foster that Freedom of Speech? I appreciate that Mr. Adler thinks a consumer "experiences" database is a really good idea (I disagree) but since when do our tax dollars need to be used to provide it? Is that the only option that makes sense? And that goes double for such a dangerous proposal that presents the realistic prospect of discouraging investment and other economic activity. So many words wasted on people who won't listen. Expect a "spirited" debate on the database as foreplay followed by the 3-2 partisan screwing that masquerades as safety administration these days. The song plays on . . . . These days, you can count on the CPSC to hold against regulated companies, particularly in response to media inquiries. Facts are a secondary consideration. The WORST thing that could happen to you or your product is if a reporter calls the CPSC. You're cooked - safety administration these days is some sort of reality show, and everything's dangerous if a reporter is sniffing around. And three years later, they'll hit you with a big penalty. This week's crisis is the "discovery" by the Associated Press that some enamels used on glassware (the outside) have lead or cadmium bound in. The recall fo 12 million acknowledged safe Shrek glasses was the first indicator that we faced a "crisis". When confronted with the "shocking" news that other coated glasses besides Shrek had lead or cadmium in the enamels, the CPSC withered. They caved, and labeled these glasses (all very likely safe but featuring Super Hero images and the like) as "Children's Products". Here's a video of the reporter enjoying his 15 minutes of fame playing off the Shrek scare. He concedes that even HE thinks the risk is "low". No matter, it's good to stir up the mud. AP needs all the coverage it can get these days. I am so happy we are being ruled by junk scientists now. And the CPSC's determination that these products are "Children's Products" means they are subject to CPSIA regulation. This empowers the agency to recall them "out of an abundance of caution" and to impose penalties for failures to comply with the myriad rules of the CPSIA. No matter that this classification was hardly clear previously. Hmmm. Let's see how the mishmash interpretative rule on "Children's Products" makes this determination "clear". I say "mishmash" because I defy you to figure this out for yourself by reading all the pages they threw at us. In fact, the latest "interpretation" in the so-called Final Rule does NOT seem to override the interpretive dicta in the prior version. It merely comments on the public comments that the agency by-and-large utterly ignored. The CPSC never bothers to reissue or conform past rules or interpretations. That's a job for us hobbyists. "The more of these types of characteristics that a product has, the greater the likelihood that the product is a children’s product. For example, a pen which is decorated or whose advertising and marketing features themes that correspond to obvious children’s interests, e.g., preschool characters, will greatly influence the purchase for preschool children. However, there also are ‘novelty’ pens that could appeal to children 12 years of age or younger as well as older children and adults; such novelty pens would not be considered to be primarily intended for children. For example, a simple ball point stick pen bearing an elementary school’s name, without any other decorations, would likely appeal to anyone (i.e. students, teachers, parents) connected with the school. A pen with a silly head on the top, not associated with any particular mass media (and not sold in toy stores), may have just as much appeal to adults as it would to children. Pens with puzzle features that allow the user to take them apart and reconfigure the design also are likely to appeal to children and adults alike, and thus, are not likely to be considered children’s products because they are not primarily intended for children." Remember, we in industry must interpret this gobbledygook and run our businesses. Perhaps even more difficult is to use "rules" like this in agreement with your dealers. Basically, since the rules make no sense, it is not possible to agree with many or sometimes ANY of your customers. Welcome to my world. It is extremely unfortunate that in the wake of conceding the safety of the Shrek glassware, and even worse, in the face of explicit exemptions of glazings in the FHSA, the CPSC would proceed to declare these items within the scope of its regulations, thus exposing yet another group of innocent companies to huge unexpected and unjustified losses. Brands will be further damaged, consumer confidence dented, and no doubt, sales of children's products will be bruised in the prime selling season. Good going, government! This agency seems downright dense about the impact of its activities. For myself, this act proves that the CPSC cannot be trusted, has lost any sense of what constitutes safe or unsafe, and is dangerously reactive (especially in response to members of Congress and members of the press). For regulated companies, this is the worst of times - we face a looney regulator who is absolutely devoid of self-discipline or judgment. They administer a kind of "hang-'em-high" justice. If you are ever in the gray area with the CPSC, you can count on them to push you over the edge. Their rationale - you have to err on the side of safety even if you have no reasonable basis to suspect that any safety issues existed. Okay, I get it. But when the regulator has no idea where "safety" is, erring on the side of safety means pleasing reporters who are trying to sell papers. Reporters sell fear - that's the only way to sell papers these days. Connect the dots - random losses are coming to all of us. Selling children's products is for crazy people. I cannot believe the damage being inflicted by these people. The database gets approved tomorrow. Enjoy the ride! We know that the Dems aren't listening to our concerns about the public database and we know they fully intend to move forward with their proposal this Wednesday. The outcome is so certain that the consumer groups can't resist clucking about it to the press BEFORE it happens. It's a set-up. Too bad for us . . . .
We also know that behind closed doors, the Dems are expressing little confidence that the database has any safety utility. Apparently, they have not acted to hire a SINGLE new employee to process or check the filings in the database project. "Post it and Forget it" is said to be their attitude. It is hard to see how this constitutes even the slightest effort to address the legitimate concerns of manufacturers in the database. Notwithstanding the assurances by consumer groups that we regulated companies have participated "fully" in the process of creating the rules of the database, this laissez-faire approach is hardly comforting. Late last week, the agency released answers to Anne Northup's follow-up questions on the database. These answers give further perspective on what's at stake here. Just a reminder, the CPSC hasn't hired anyone to process entries into the database. And don't forget, the CPSC plans a big marketing blitz on the database, encouraging consumer submissions. The foregoing data sources do not enjoy marketing support and still produce massive data submissions. Considering the liberal definition of who can file under the Dem proposal, the submission numbers could easily swell into the many tens of thousands per year. The agency also concedes that the filings in the database may be much more detail-rich than the foregoing filings, only compounding the obvious issue. Garbage in, garbage out. Too bad for us . . . .
b. The agency currently investigates less than 20% of "incidents" filed with the CPSC (2009 statistics). The pool of incidents totalled 16,000 in the most recent fiscal year, resulting in a 14% investigation rate. NEISS is not investigated. IPII is investigated at a lower rate, with 51,541 reports in 2009 and 4,915 investigations. The plans for the new database call for a 0% investigation rate (of accuracy). I am sure the CSPC will troll the database aggressively to investigate YOU but not to investigate the validity of the claims. Remember, manufacturers are always suspect, the submitters never are suspect. c. The CPSC has no idea how much time it will have to spend to investigate a claim of inaccuracy by a manufacturer. Of course, the odds of such an inaccuracy claim are reduced sharply by the limited data disclosure to manufacturers, making a rational claim of inaccuracy rather difficult. And as more consumers come to believe that filing with the database is a substitute for direct communication with manufacturers (or perhaps an even better form of communication, informing the manufacturer and the "cops" at the same time), the flow of information to manufacturers will degrade, making accurate and insightful assessments increasingly more difficult. No doubt trust between consumers and manufacturers will erode, too. Too bad for us. . . .
d. Current database entry QC by the agency does not make "any judgment on the validity of concerns expressed by the submitter". Screening seems to be entirely comprised of searches for inconsistencies. They look for coding errors, among other errors. Some randomized checking against the original documentation is also conducted. Only about 4% of the data is bounced (of which, 40% are rejected as duplicates). The rest are bounced principally for being out of scope (beyond the CPSC's jurisdiction) or because no product type is identified. In other words, the CPSC hardly ever catches any errors or fraud in database entries. Hmmm. Sounds very thorough to me. The plans of the agency to review the data being included in the database does not include, as far as I can tell, ANY effort to verify accuracy - just to focus on the criteria for inclusion. e. NHTSA database provides contact information of the submitter to the manufacturer. The CPSIA database will NOT - because the CPSIA explicitly forbids it. That's call the "will of Congress". It's also called stupid legislative drafting and a boneheaded idea. And the net effect of all these little problems? Will the Dems pause to consider the impact on markets? On small businesses? On safety in general? Perform a more open-minded cost/benefit analysis? Trim the database concept back until its value is better understood? As Public Citizen tell us, we can scream from the rooftops all we want, but the Dems are marching forward. Who can complain, since we have participated "fully" in this process?! In response to my last blogpost, a little bird contacted me with some thoughts about the public database that consumer advocates and their leftist political allies are cramming down our throats. Apparently, there's a big gulf between what the Commissioners are saying publicly and what they are saying privately. Take it for what it's worth. While you might not agree with the POV purportedly adopted by the Dems below, it certainly portrays them as rational. I think that's right - they know what they're doing and are doing it by choice, rather than by coercion. The fact that their actions will be harmful to the regulated community is not lost on them, but we're just not their priority. THAT'S the real problem here. a. While the Dems "support" the database, they are privately acknowledging that it is a colossal waste of time and staff resources. They do NOT believe the database will be full of useful information to anyone. Why should you believe this? According to a reliable little bird on my window sill, the CPSC has not hired even ONE person to process all the information that will be posted in the database. The reason - the leaders don't care if the data is correct or not. The phrase "post it and forget it" is their agenda. Did you catch that? POST IT AND FORGET IT. I believe I recall Rachel Weintraub touting the credibility and accuracy of this data. Hmmm. My so-and-so detector is going off . . . .
b. The driving plan of the Dems is to spend as little as possible on the database. They consider it a diversion of their scarce staff resources. They believe the database will do nothing - or almost nothing - to improve safety so why put money into it? But they will vote for it - that's the price of their political patrons - and I guess the impact of this useless database on your business and your willingness to engage in business activities is none of their concern. So they'll implement it and fill it with garbage. Who cares . . . .
c. The speeches touting the database are intended to please the consumer groups and the political patrons of the Dems running the shop. d. There is a recognition that allowing the database to swallow up resources at the agency will interfere with the real work of the agency. The Dems actually want to keep people safe so they are going to spend the bare minimum on the database. The agency doing the bare minimum on the database should be the most frightening thing you have ever read about the database. And it's true. You're not meant to know any of this. This freedom of speech thing is a real pain in the neck for our overlords. It's time to get REALLY scared about the database. Let's not forget, safety is not a partisan issue. Yeah, right. But it's true - the Dems control this vote and are going ahead with their rule, damn the consequences. And there will be MANY terrible consequences. I testified about the database last year and laid out many problems (see my testimony here). Industry has in fact pointed out many issues with the database, such as (a) the consequences of inaccurate information, (b) the consequences of manipulative or misleading information posted by trial lawyers or competitors, (c) the irreversibility of damage from adverse publicity, (d) the database as a government-sponsored and administered feeding ground for plaintiffs lawyers, (e) the negative impact of encouraging consumers to disclose problems to a database which withholds information from manufacturers, rather than direct communication, (f) federal government intrusion to replace or supplant private market solutions, (g) the debasement of Constitutionally-guaranteed due process rights and other protections afforded to litigants and possible victims of abuse of government power, and (h) the likelihood that the database will severely punish small businesses while having only marginal impact on the intended targets, mass market companies. This seems a bit treacherous for something is said to be so "good" for everyone. Is there a problem here with selective hearing? How do the Dems justify their position? Well, first of all, they don't need to. Learning at the feet of Nancy Pelosi and Henry Waxman, the Dem Commissioners know that their voting power is all the justification they need. They have the votes, therefore they have a "mandate" from the voters, right? Why else would a Commissioner state publicly that anecdotes aren't evidence? Troubling details from little people don't matter anymore - not if the details might get in the way of the "agenda". The Dems and their allies also hide behind the NHTSA vehicle defects database. I find this so interesting because the ever-attentive CPSC heard testimony that debunked this example (same hearing that I testified in a year ago). The NHTSA example can be distinguished in many significant ways: (a) auto accidents are a leading cause of death in this country (consumer products are not), (b) every use of automobiles is known to be hazardous (not true for consumer products), (c) the auto industry is one of the largest components of our entire economy - we all use cars and many of us owe our livelihoods to automobiles one way or the other (the average sale of consumer products is far less than a car), and (d) the industry is highly consolidated among a relatively small number of massive companies that are quite well-prepared for litigation and regulatory issues (consumer products is not a consolidated market). General Motors went public today, completing its recovery from bankruptcy and its $60 billion bailout. I think GM and other automakers can handle the burden and risk of a database of deaths and serious injuries from use of their products. Learning Resources, on the other hand, ain't no GM or Toyota. The NHTSA database sets an inappropriate example for consumer products for all of the foregoing reasons. Providing further cover is the Rogue's Gallery of leftist consumer advocates who spin yarns to support the decisions of the Dem Commissioners. Many of their assertions are bald-faced lies. Example No. 1: "'Right now, people can't easily find out about products that they may buy or that they use every day with their family,' said Rachel Weintraub, director of product safety for the Consumer Federation of America. 'This database will provide consumers with credible, accurate information.'" This is two lies by Rachel Weintraub. First lie - consumers "can't easily find out about products". Really? I recently wrote about consumer comments on Amazon for a product that was recalled - is that so hard to find? What about ConsumerSearch.com? ePinions.com? Consumer Reports Forums? All the large volume online retailers allow consumers to post reviews. I think it's certainly true that consumer exchange of information online is both plentiful and easy to find. I also think it's also a matter of opinion whether the federal government has a role to play here in this exercise of free speech - particularly if in the process, the government tramples on Constitutionally-guaranteed rights of due process of other members of our community. Second lie (more glaring): "This database will provide consumers with credible, accurate information." This is a doozie. From Section 1102.42 of the proposed rule: "The Commission does not guarantee the accuracy, completeness, or adequacy of the contents of the Consumer Product Safety Information Database, particularly with respect to the accuracy, completeness, or adequacy of information submitted by persons outside of the CPSC. The Consumer Product Safety Information Database will contain a notice to this effect that will be prominently and conspicuously displayed on the Database and on any documents that are printed from the Database." [Emphasis added] On the other hand, perhaps Rachel is on to something - by publishing unverified and untrustworthy data on a government-run database, it will certainly LOOK credible and accurate! Practically the same thing these days . . . . I would observe that while this disclaimer is going to be widely posted on the database, the name of the site is SaferProducts.org. What does this name imply to you? I take away that (1) I should be scared of dangerous products, (2) this website is where I can find out the "truth", and (3) thank heavens for my government for making me safer (let's increase the CPSC budget!). Ahem - I thought the CPSC does not guarantee the accuracy, completeness or adequacy of the information in the database so why is the website called "SaferProducts"? Should I feel "safer"? Was I supposed to feel endangered before? That's the idea, kids. But if Rachel says the postings are credible and accurate, there's nothing to worry about, right? Provides some nice cover for our leaders . . . . Example No. 2: Says Ami Gadhia of Consumers Union: "Commission staffers have worked very hard to ensure that the database is fair to everyone." Someone please define "worked very hard" and "ensure" for me. Please watch my testimony again and tell me what protections CPSC staffers designed for ME. I interpret Ms. Gadhia's lie as connoting that "fair" to her views is tantamount to "fair to everyone". My interests don't matter. Besides, Rachel is sure everything will be credible and accurate. That sounds fair . . . even if it's completely untrue. Example No. 3: Says Rachel Weintraub: "Every effort has been made to ensure that the information is accurate. . . . Otherwise, the database won't be useful to anyone." Every effort, huh? Manufacturers don't get to talk to the person who files the report or to the victim or see photos or samples submitted. Only our government can be trusted with that information for reasons not clear to me. The carefully "vetted" reports must be sent out within five days to manufacturers. We live in a country with 300 million people. Are you telling me that the agency is going to carefully "vet" the reports we inundate them with in just five days? Perhaps they need hire a few hundred more highly-trained associates to push this paper. You are more than welcome to read the proposed final rule to learn about the agency's proposed procedure to "ensure that the information is accurate". Read Section 1102.10 (page 227 in this 248-page document). But I think I can save you some time. The filer has to confirm that he's not lying ("A submitter of a report of harm must affirmatively verify that he or she has reviewed the report of harm, and that the information contained therein is true and accurate to the best of the submitter’s knowledge, information, and belief"). That's certainly foolproof. Among the various required redactions and other agency "oversight" of this data, you will NOT find anything like an investigation. They are simply scrubbing and re-publishing someone else's allegations. Under their procedures, they cannot possibly know if what they are publishing is true or false. No wonder they disclaim accuracy, completeness or accuracy. Example No. 4: Christine Hines of Public Citizen (from BNA): "She added that several hearings, workshops, and comment opportunities have provided the public and industry every opportunity to address concerns. 'Industry has participated fully in the entire process.'" We, the regulated community, have had "every opportunity" to "address" our concerns. This apparently constitutes participating "fully in the entire process". This is much more than spin, this is another flat-out lie. You cannot assert that we have participated fully if we have been utterly ignored. The hearings were not for VENTING. As previously noted, Matt Howsare asked me to spend our company's money to fly to Washington to testify on this database - and then blew off every point I made. Small business concerns were almost explicitly disregarded. We cannot be said to have had "every opportunity" to address our concerns if the impact on small business could be sloughed off. Was Nancy Nord afforded "every opportunity" when she was gaveled silent in the hearing on the database? This one isn't a lie: [from BNA:] "[Weintraub] said the CFA, like Public Citizen, supports the current version. 'We think [the database rule] strikes the right balance between Congress's intent and making the database usable while protecting manufacturers' interests,' Weintraub told BNA. The substitute rule would 'limit the utility of the database for other consumers and public health professionals in terms of unnecessarily limiting who can report,' as well as including other limiting provisions, she said." Why isn't that a lie, too? Because she states that it is her opinion. She's wrong - but at least she's not lying this time. The poison in the CPSIA is actually the handiwork of a small and energetic group of individuals, many of whom are featured here. They hide behind consumer-friendly sounding corganization names but are actually just troglodyte anti-business advocates. They are no less cartoonish than the way they portray us, but with the Dems running the CPSC, the "good intentions" of this group and the persuasive power of their phobias have the upper hand. As all the consumer advocates say, the outcome here is hardly in doubt. But feel good about it - you have had "every opportunity" to address your concerns and have "participated fully" in the entire process. Empty words and lies. That's what this mess has become. The CPSC Commission vote on the public database scheduled for tomorrow has been delayed until the day before Thanksgiving (November 24th). Talk about Turkey Day . . . .
We have seen delays like this in the past. These pauses generally reflect infighting among the Commissioners. Don't be fooled by the squabbling - it doesn't mean that any light bulbs are going on. The Commissioners know exactly what they're doing when they install a database gift wrapped for trial lawyers. The Democratic majority and Republican minority may be on different sides but neither group is dumb - they don't buy the baloney that the leftist consumer advocates fling around - they know it isn't "extremely difficult" to keep your family safe from "dangerous products", they know that American consumers have many ways and places to share negative experiences with products online, they know that this venue will be an abasement of basic due process rights of manufacturers. They get it - they know they will be sending us down the river when they adopt this rule. The difference is that the Republicans don't want to send us down the river. The Dems show absolutely NO SIGN of caring. The outcome of the vote is certain. So is the eventual loss of more jobs. So what's the point of the delay? Why not just get it over with? The extra week gives them more time to bicker among themselves. Perhaps that gives the appearance of dialogue and "debate". Then they will pull the trigger. You can guess where the bullet will go. I am writing in response to your November 3rd letter entitled “Delivering on Our Commitment” in which you call for increased Congressional oversight of federal agencies legislating through regulations. My industry, the children’s product industry, is a victim of this kind of regulatory abuse. The Consumer Product Safety Commission's (CPSC) blizzard of new safety rules and regulations sharply ramps up government intrusions into markets by adopting the suffocating “precautionary principle” as its legal standard. This European-style approach to regulation, while doing nothing to improve the safety of products, is a job-killer and a business-killer plain and simple. In August 2008, Congress passed the “Consumer Product Safety Improvement Act of 2008” (CPSIA). The CPSIA had a noble purpose – to improve safety for children’s products by tightly regulating lead and phthalates (a plastic softener). It is a cliché now to observe that this flawed law was beset by “unintended consequences.” Unfortunately, Congress and the CPSC have been unmoved by the chaos that has ensued in the marketplace and the business community’s persistent pleas for relief. Small businesses are notable and well-documented victims of this law. The children’s product industry, as defined by the CPSIA, goes far beyond toys and spans the U.S. economy. Children’s products under the definition of the CPSIA include ATVs, motorcycles, bicycles, pens, educational products, books, consumer electronics, apparel, shoes, jewelry, DVDs, furniture, musical instruments, carpeting and so on. Even the local resale shop and your own garage sale are now subject to new regulation under this law. Our objections to this law do not reflect callousness toward safety. Quite the contrary, our industry’s lifeblood is children – and our outstanding safety track record befits an industry of caring adults. None of us want to endanger children. Likewise, we cannot tolerate being subject to laws that make operating our businesses unprofitable or exceptionally risky. The CPSIA saga has become the poster child for “over-regulation”. While proponents of this safety law stress the possibility of injury to children (the curb appeal of the law), they fail to account for the probability of injury or prove a nexus between our products and the few known injuries. This is a critical distinction. While advocates argue that the so-called “Year of the Recall” justifies the arch new legal regime (473 products were recalled in 2007), the fact remains that children’s product recalls by the CPSC are associated with only one death (from a piece of leaded jewelry) and three unverified injuries over the 11-year period from 1999-2010 (according to published CPSC recall notices). By comparison, CPSIA compliance costs have been estimated to be more than $5.6 billion per annum. We all agree that lead is a dangerous natural substance that can harm children – but the question is HOW. Other federal agencies, like the Environmental Protection Agency and the Center for Disease Control, point to house paint, industrial pollution and the residual effects of leaded gasoline as causes of elevated blood lead levels in children. The connection between lead in children’s products and injuries from lead remains undocumented. Daily intake of lead from children’s products is less than daily intake from food, water and the air, yet the CPSC remains undeterred. Likewise, phthalates concerns remain highly controversial. The safety advocates have yet to produce a single known victim of phthalates – other than our businesses. Notably, since passage of the CPSIA in 2008, the agency recalled only one product for phthalates – 140 inflatable toy baseball bats. Even so, our company may have to spend hundreds of thousands of dollars on phthalates testing annually under the new law. The agency’s response to lead and phthalates has been to impose a multi-billion dollar annual compliance cost accompanied by threats of heavy penalties, injunctions by the U.S. Attorney and possible felony charges. The agency’s obsession with lead and phthalates has led some staff members to refer to it as the “Children’s Product Safety Commission.” By comparison, the agency devotes few resources to swimming pools and spas, for instance, which account for more than one childhood death and between 11 and 12 serious injuries EVERY DAY according to the CPSC. I believe these confused priorities represent a subversion of the purpose of this agency under federal law. Efforts to blunt the CPSIA’s impact have fallen on deaf ears. Sadly, Congress’ refusal to address the law’s shortcomings has only made the problem worse for the industry. Since passage, the CPSIA has been the subject of only one oversight hearing with a single witness, CPSC Chairman Inez Tenenbaum. There have been two other hearings, one by a subcommittee of the House Committee on Small Business and the other by a subcommittee of the House Committee on Energy and Commerce. Congress has never chosen to act on the many documented abuses of the business community under this law. The agency itself has held innumerable hearings and called for public comments again and again, but few objections of the regulated community have influenced outcomes. Votes on the Commission are now often on partisan lines – an abomination if one concedes that safety is not a partisan issue. The regulatory nightmare of the CPSIA yawns wide in front of us. I testified before Congress in April 2010 that my company is now subject to more than 2500 pages of laws, regulations, rulings and other disorganized documents. Prior to the CPSIA, we were responsible to follow about 80 pages of rules, most of which did not apply to us on a daily basis. The total number of pages of applicable laws and rules now balloons far larger than Obamacare – and any violation of any sentence constitutes a possible felony offense under the terms of the CPSIA. We also must bear the risk that any of the 50 State Attorneys General might enforce this law if the CPSC defers. It is a regulatory nightmare of Orwellian dimensions. The CPSIA is an economic depressant by any definition. The issues under the CPSIA fall into four categories: (a) Cost, (b) Complexity, (c) Legal risk and (d) Government intrusion. Our markets are now in total disarray because of the massive intrusion of the federal government along with scare tactics used by regulators trying to coerce compliance and, at the same time, obtain larger funding from Congress. Ironically, the more the agency uses the CPSIA to make us look bad, the more essential and irreplaceable they make themselves look. This perverse incentive is hard to combat. We need Congress to stop this madness. The problems with the CPSIA and its implementation by the CPSC deserve much closer Congressional scrutiny. Our employees, our retailers and suppliers, and most importantly, the schools, teachers, families and children who want, need and depend on our educational products are counting on the new majority party in the House to restore sanity to federal safety administration. Thank you for your urgent consideration of this matter. Please do not hesitate to contact me with any questions or comments. The CPSC Commission will be voting on a final rule governing the new public database for product safety complaints on Wednesday. The final rule tips the scales at 248 pages. I know I am a public utility. . . but it's confession time - I didn't read it. I know what's in there and the Powers-That-Be don't care what I think anyhow. Commissioners Nord and Northup have published their own alternate rule. It must be worse than the CPSC's proposed final rule because it's much shorter, only 27 pages long. I read the Nord/Northup rule - they asked for comments and I believe they will actually listen. It won't matter because the Commission now votes on party lines, so our comments are irrelevant. The Dems already know what they intend to do. Adler, Tenenbaum and the out-of-office Moore vote as a pack and do as they collectively please. Perhaps this time they won't even bother to make a pretense of listening to Nord or Northup. I picture the meeting going quickly as the Dems all put on their iPods and ear buds while Nord and Northup have their say. Might as well bop to iTunes, Commissioner communication is at a standstill anyhow. Relax and enjoy it, kids! You'll love it. What could possibly go wrong??? I greatly appreciate the effort and the gesture. They didn't have to do this, and made a game effort to help out. Their rule has as much of a future as the 2010 Cubs but nonetheless, I admire their commitment to their job responsibilities and to the market the CPSC regulates. Nord and Northup recognize the many risks implicit in the database idea and attempt to fix as much as they can within the context of the deeply-flawed CPSIA, the law of the land. Thank you for trying. 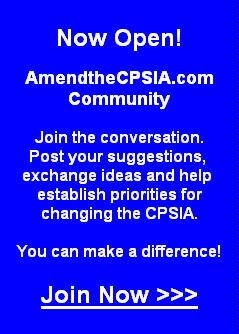 The proposal commendably attempts to limit who can post in the database by narrowly interpreting the CPSIA. This is an appropriate regulatory agency response to an excessive law, something a well-run federal agency would do to keep the trains moving on time. Naturally, the agency has not opted for that courageous route over the past two years. Much of the proposed rule involves what can be disclosed, how to protest inaccurate information and the disclosure of confidential information. It is highly technical - your eyes will glaze over. It's all necessary to make the best of a bad situation. The basic concept of the database is that the government must set up coercive rules to make "bad" companies do the right thing. Apparently, the geniuses behind the database assumed that we cartoonish corporate bad guys would never exercise good judgment without the pressure of the public database. Many steps backward resulted. For instance, the Nord/Northup proposal says that manufacturers will not be provided the name or contact information of the submitter of the complaint or the injured party. We also won't receive photographs of the injury. And this is for what purpose? Apparently by withholding this information, the CPSC enhances the ability of manufacturers to do their job. I believe this is a reversal of current practice. a. "Trying to keep your family safe from dangerous products is extraordinarily challenging." RW - Is that really true? What is the evidence that we are all "in danger"? This is not an exaggeration - this is a LIE. b. "As much energy as the U.S. Consumer Product Safety Commission spends trying to alert consumers to hazardous products, an alarming amount of the information it possesses is kept secret." RW - Enforcement investigations and enforcements themselves are very closely associated with litigation. Confidentiality is absolutely ESSENTIAL for any semblance of due process, a Constitutionally-guaranteed right, even for corporations. The Rule of Law protects us all, even if we must tolerate some sacrifices, such as the sanctity of confidential investigations. That DARNED Constitution, so inconvenient. c. "Releasing all this information is a frightening and annoying prospect to many companies, who fear tarnished reputations." RW - There's a lot more to fear in the database than just tarnished reputations. Let's not overlook that the Internet exists. We manufacturers live in a world where the consumer is KING - our reputations are on the line every day already. There are already many websites ready and willing to let you bash away at us, as long as you let them sell ads. So it MUST be something more than "tarnished reputations" that is causing all that fear. Could it be . . . heightened litigation and liability risk??? d. "Nancy Nord and Anne Northup want further restrictions on such things as whose reports can be included in the database (no lawyers acting on a victim's behalf, thank you) . . . . Traditionally, Nord and Northup are on the losing side of 3-2 votes, but they're not going down quietly." RW - Safety is now PARTISAN at the CPSC. In other words, in their spin machine, Democrats CARE deeply about kids and Republicans are heartless money-grubbers. These days the caring Dems run the show and money-grubbers are always outvoted. I know you like a good story at bedtime! Bad Republicans, good Democrats. Sweet dreams. RW - The CLASSIC mischaracterization of our market that it's all about big companies. This guy has Mattel and Graco on the mind. The irony is that the mass market companies could care less. The ones who will be CRUSHED are the small businesses. Let's not forget that Mattel gets to test its own products - and when it LATER had a recall of 11 million units of its merchandise, no one asked any questions about testing. The rules are hardly even a blip to those guys. The cost to Mattel from that massive recall: ONE PENNY PER SHARE. The database is just another sidelight for them. The story is rather different for small businesses, however. Not that the CPSC cares . . . . So why do I hate the database? 1. There is a big difference between restaurant reviews and "United Breaks Guitars", and product liability. The database is all about litigation and liability risk. Reputational reviews are about goodwill, but the database has to do with systemic risk for our businesses. It is a pro-plaintiff distortion in an already out-of-control tort system. Fundamentally, reputation is about consumer as king. Liability is about bloodsucking lawyers as king. This database is not designed to inform consumers well - the information is not certified. So why have a garbage in-garbage out database. It's intended to foster more vexatious litigation. Read the WalletPop article again - it's clear that the database is intended to be coercive. How do you suppose it will be coercive? 2. The government has no business lending a hand to tort lawyers. The tort system which provides the "little guy" with a way to seek redress functions just fine. The New York Times just published a study on hedge fund investing in tort lawsuits. Must be quite the cash cow if those guys are getting into it. The database gives them a new target - you. Why is it appropriate for the CPSC to oversee the disbursement of this information? Do you think this will raise our standard of living? Create jobs? Increase capital available for investment? It is worth noting that the database will create an expansion of the role of government in our markets. This is classic government bureaucratic creep where the government attempts to compete with the open market. Yes, there is that Internet thing. All those new tedious jobs, those eyes-glaze-over procedures must be administered by freshly-minted bureaucrats. The database must be built and maintained on government servers. Decisions will need to be made, filings and "transmittals" processed, deadlines watched, complaints followed up. This is PURE overhead. [And there is also the even larger devotion of resources that will need to be deployed by manufacturers.] Read the rules and ask yourself - will the world be better with all the new rules? With this expansion of our government? Isn't this what you read about in the papers every day? I am so, so sick of it. When will it end? 3. There is no economic justification for the excessive risk that the government is forcing on the market. The children's market has not been killing or maiming kids in large numbers. Let's not forget that we are a country of 300 million and it is not a utopia - some injuries will happen. [My apologies, I don't mean to burst your bubble.] Far more kids are killed or maimed in swimming pools than in any other children's product activity. Apparently those kinds of deaths and injuries are not as troubling as other kinds of childhood deaths and injuries - there is no database on swimming pools. 4. The database is definitely subject to manipulation by competitors and other agents of corporate extortion and destruction (like bloodsucking lawyers). That is, under the proposal that Tenenbaum and Co. will pass when they take off their ear buds on Wednesday. For myself, I am particularly apprehensive about the stress that the database will place on our company. We will get notice in five days and have ten days to reply. Since the agency is going to launch a publicity campaign to convince the public to report every nit in the database, I expect MANY such postings. Now every broken toy will be a potential liability for our company, and trivial incidents will become our top priority. Forget about growing our business - it's catering to the exigencies of the database that will matter. Still, I cannot imagine making the database the centerpiece of my business life. I also don't know how we are supposed to answer a lawyer who asks how we monitor this database if we ignore it. Damned if you do and damned if don't. Not that the CPSC cares. I can hear the advocates now - "This is what we want companies to do. They need to be 'responsible' and pay attention to their products and their customers." Well, that presumes that we weren't doing that already. In any event, we choose what we do every day. If you make us miserable enough, we'll get out of this market fast. And that's what the CPSC seems committed to do. I think the database will quickly supplant the old way of finding out that there was a problem with our products - namely that our customers would call or write us. So they will place this information anonymously in a database and we will not be able to interview them or see their product. This puts us more in the dark and makes our job much harder. Or impossible. Brave new world . . . . The whole subject depresses me. Be prepared for more fireworks and then the expected outcome on Wednesday. Our opinions will not sway the Majority (remember, Adler told us that anecdotes aren't evidence, so they are free to ignore us and our amusing anecdotes). And after this ugly business is concluded, you know what's next . . . the 15 Month Rule. Then we're goners, once and for all. Eric Cantor, where are you??? I appeared on Fox Business tonight. Please check it out. "A remark generally hurts in proportion to its truth." The embargoed counter-proposal on the public database published this week by Republican CPSC Commissioners Nancy Nord and Anne Northup was briefly available online. During its fleeting moment in the sunshine, we were able to capture it and make it avaiable for your reading pleasure now. The apparent reason that the Powers-That-Be took this proposal down was that Nord and Northup asked you to give "comments" on their ideas. Whoa, that's across the line, baby! Comments solicited from the public must be authorized by a vote of the Commission, especially if the proposal was not written by a Democrat. Unfortunately, I have not been able to verify what kind of Commission vote is required to READ public comments. I suggest you send comments in to Nord and Northup urgently. I think they might even read them! Courtesy of your Congress and the mania promoted by our essential CPSC, Walmart has kindly begun to test to a 100 ppm lead standard. The testing has already begun, to keep everyone so so SOOOOO safe, and applies to anything offered for sale on or after August 14, 2011. They have settled on this standard now even though your CPSC has not determined that it is "technologically feasible". Another big win for Waxman and his henchmen. . . . Isn't that nice? Walmart is plunging into the void left by a Congress that abandoned YOU and YOUR BUSINESS. By making this a requirement of theirs, Walmart joins the effort to implement Mr. Waxman's vision of a Utopian America, lead-free whether we like it or not - damn the consequences! Who is at fault here? First and foremost, stubborn Congressional Democrats who KNOW this is a problem but refuse to act. The fact is that the 100 ppm standard means NOTHING to safety and cannot be justified on any rational economic or public health basis. Of course, I discount raging paranoia or paralyzing anxiety as a justification for the standard. I know, I know, I am small-minded. Unfortunately, for businesses in the REAL WORLD, the uncertainty of stupid laws that may or may not spring to life leaves us little choice but to assume they will be implemented. Hence Walmart had to implement this provision. They can't wait for Congress to stop sucking its thumb and take action. Of course, we can also blame the so-called "leadership" of the CPSC for this step. The Dems running that shop are also unable or unwilling to act to prevent any of this damage. There is little to indicate that the CPSC Dems WANT to prevent this economic damage which I speculate is out of loyalty to their political patrons. Whatever the reason, they have done NOTHING to help industry. Take them off your Xmas card list. We are not the only ones suffering at the hand of the worst Congress in history. Consider the one sentence in the Obamacare bill that requires vending machines to list calorie counts on a sign. According to a FDA Federal Register release on Friday, this will require 14 million man-hours of work per annum. Time well spent. Welcome to our world, guys. . . . One sentence in Obamacare did this, out of 2,000+ pages. Happy reading - imagine what the rest of the law says! I will be on Fox Business on Wednesday at 7 PM EST discussing the election. I am looking forward to help from a Republican-dominated Congress but must say that the firemen better come quick. This Walmart step is just one more to be immediately undone. Can Congress save us? Will the marketplace ever revert to sanity, given that the CPSC is now crazy? It's put up or shut time for the Republicans. They need to act FAST and EFFECTIVELY. We are dying out here. CPSIA - Report Abusive Database Rule to Eric Cantor! Today, Republican CPSC Commissioners Nancy Nord and Anne Northup, noting the stifled debate orchestrated by Democratic CPSC Commissioners on the final public database rule (up for a vote on November 17th) and the toxic impact of that rule on the business community, have proposed their own alternative rule on the database. HERE is the link to the Nord/Northup proposal. I believe the CPSC is currently mud wrestling over whether the Nord/Northup alternative proposal can be shown to you . . . the public. I think the Dems don't think you are mature enough to be able to read it. Perhaps when you're older . . . . Here is Nancy Nord's blogpost and Anne Northup's blogpost relating to their proposed new rule. I also want to commend Ms. Northup's three other blogposts on this topic, beginning on October 27. It is gratifying to see Commissioners taking political risk to do the right thing. Both Ms. Nord and Ms. Northup are taking a stand here. Let's hope that fighting breaks out on other issues, too. We need the help. This proposal by two Republican Commissioners is yet more shocking evidence that at today's CPSC, safety and market integrity is an entirely partisan issue. Frankly, I don't understand this and find it all so outrageous. In my view, this cartoonish standoff is ENTIRELY the fault of the Democrats who are stone deaf to the legitimate concerns of the business community. The hollow words of Inez Tenenbaum committing to "dialogue" with stakeholders makes me want to scream. Consider, for instance, that I testified at the hearing on the database on November 10, 2009 at the personal request of Matt Howsare, Tenenbaum's then counsel (now her Chief of Staff). Ms. Tenenbaum purportedly wanted my feedback on this critical proposal, and as it was related to me, the agency needed more comments from the business community. Naively, I spent our company's money to fly to Washington to accommodate this seemingly reasonable request. I am accepting Fool of the Year nominations at this time. . . . This hearing took place almost exactly ONE YEAR AGO - plenty of time for Ms. Tenenbaum to absorb my testimony. Listen to my testimony - did the majority take ANY of my points seriously? According to Nancy Nord, she was not allowed to ask at the October 20th Commission meeting about CPSC Staff's conclusion that the rule would have an insignificant impact on small business - the ENTIRE focus of my testimony in November 2009. Don't kid yourself, staff conclusions like this are are driven from ABOVE - from Ms. Tenenbaum and her political patrons. Ms. Nord was gaveled silent by the majority party - they had heard enough, I guess. Other issues impacting business interests from a fairness standpoint were also ignored or blunted. This kind of treatment is completely outrageous. This example of government-out-of-control explains why the public spoke so profoundly last Tuesday. Nevertheless, the people running the shop at the CPSC didn't hear you on Election Day. We MUST stop the Dem's plan - unless you want to be eaten alive by trial lawyers. Listen to my testimony - it's a road map to litigation doom. Eric Cantor has called for substantially increasing Congressional oversight of the activities of federal agencies which he says are "now actively working to enact [President Obama's] agenda through agency regulations". Could Tenenbaum, Adler and Co. be doing JUST THAT at the CPSC right now? Hmmm. Please WRITE ERIC CANTOR to tell him what you think. His fax number is 202-225-0011. Please post your letter as a comment to this blog. Hey, did you ever wonder what it might take to satisfy a mass market retailer on safety in the post-CPSIA world? Here are the requirements of Costco - all 141 pages of fun. It's a huge file - you may have wait a little while for it to fully download. These documents took us six man-hours to read - to assess whether or not we understood the rules and whether we knew what to do to comply. The breathtaking out-of-pocket testing costs are scattered throughout the document - see pages 40, 41, 51, 58 and 131-134. Needless to say, compliance with these rules is an exceptionally expensive undertaking. This kind of duplicative testing (you have to use their testing vendor and cannot supply other independent tests you have already performed and paid for) has never revealed anything that I would call a "safety" issue, but has revealed numerous meaningless niggling issues that cost a ton to resolve. No one is made safer by all this expense but we are sure made poorer. All that matters these days is whether we comply with all 141 pages, every line and every word. Sometimes, I think the debate over the CPSIA mania is too abstract. It's too theoretical and sides chosen by whether you "care" about safety or not. Few people bother themselves with the details. Even fewer people are willing to be accountable for what the law has unleashed. Requirements like this 141-page document were rare before Congress took over safety administration. Now that the mania has been stoked, it is going to be hard to put the genie back in the bottle. People feel secure in a blizzard of new safety requirements. "Obviously" more requirements means more safety . . . .
Ahem, no. First of all, the more requirements, the more likely that focus shifts from safety to compliance. SAFETY AND COMPLIANCE ARE NOT THE SAME THING. Guys, here's more bad news - tests are not always right and rarely provide meaningful information. Our supply chain is where we build in safety and by running our business properly, tests are rarely useful (we get a LOT of repetitive passing test reports). The blind faith placed in stacks of new rules and "independent" testing as a means to create "safety" is unrealistic. I remember talking to a Whirlpool engineer who assured me that EVERY recent recall of Whirlpool products had been tested under federal and state standards and passed with flying colors. Hmmm. The CPSIA safety system is devolving into a faith-based system. Even worse and much more profound is the commerce that this kind of mania extinguishes. How many companies can manage these requirements? How many companies will pass on making a deal to avoid the risk and hassle of these purposeless requirements? Regulators like to stick their heads in the sand. These after-market requirements are "not their responsibility". Let the market decide, blah blah blah. Unfortunately, they can't get off the hook so easily - they started the mania and feed it regularly with their big fines and ridiculous recalls. Sorry, we don't live in a vacuum - yes, the actions of the regulators have an impact on the market. To get a sense of it, read the 141 pages of Costco requirements. Welcome to my world! TIA Members, please sit down before reading on. Over the past three years, the Toy Industry Association famously invested millions of dollars in members' dues in something called the "Toy Safety Certification Program" (TSCP). When I say "millions", I mean it. On October 14, 2009, TIA outside counsel Rick Locker referred to "$2 million of technology" available to the industry via the TSCP website. He was referring to the cost of the program to date, roughly. The program began in August 2007 - that's about $1 million per year. The TSCP recently died a natural death, mercifully. See Carter Keithley's September 7th release on this topic. I figure the program cost NO LESS THAN $3 million of TIA members' money, perhaps more, with NO return on investment. A TOTAL loss. Ouch. Don't expect any heads to roll. The TSCP was a terrible idea from the get-go. For one thing, the TSCP was a business and the TIA should have NEVER tried to go into business in competition with its members, if only for the reason that real businesses beat dilettantes every time. I believe the business plan for the TSCP was fantastic, if it existed at all in any formal sense. No rational business person would have EVER made such a reckless investment but then again, it wasn't their money. . . so the bet apparently seemed "reasonable" to the decision-makers. The basic concept underlying this massive bet with other people's money was that if the TSCP cracked down on its own members harshly enough, the CPSC might back off and let the industry police itself. The horrific historical analogs must not have occurred to anyone, nor their tragic ends. The idea of the TSCP was flawed in several critical respects. First of all, the issues that spawned the CPSC had little to do with the standards - the problem was compliance. A program like the TSCP would hardly snare those who were indifferent to compliance - it was VOLUNTARY. Second, the theory required that the TIA be so harsh that the CPSC would let the TIA take over. Of course, this made the TSCP a rather unappetizing vehicle for most of us. And it was VOLUNTARY. We never considered participating. Worst of all, the TSCP grossly favored the mass market companies in the toy industry. This could not have been a shock to anyone as the authors of the program were largely mass market toy people. I documented this in my October 18, 2009 blogpost entitled "The TIA Just Wants to HELP You!". The program was going to kill all but a few of us, but that didn't stop the TIA. What ultimately stopped the TIA was a lack of business. Apparently, we weren't alone in disregarding the multi-million dollar investment of our industry organization. Rumor has it that certain large companies committed to using the program but then backed away when it became clear that no one was joining them in this fun. No one likes a competitive disadvantage, apparently. Who'da thunk it? And the legacy of the TSCP? The TSCP did such a great job of outlining a horrific testing scheme that the CPSC used critical elements of it as a starting place for their "15 Month Rule". You can trace the harshness of the TSCP through to the pending rule on testing frequency and "reasonable" testing programs. Yes, the TIA provided this leadership - after all, if it's good enough for the TIA, how could the industry complain? How, indeed. Pass the barf bag, please. I spoke to Neal Cohen today, the CPSC's new Small Business Ombudsman. Neal reached out to me for my perspective, which was nice of him. He has reached out to others as well, perhaps he has spoken to you. I found Neal to be an intelligent and sympathetic character, very patient (which was required when speaking to me about the CPSIA) and interested in other viewpoints. That said, by all appearances Neal does not have the power to wave a magic wand and make our troubles go away. I know some of you anticipated that the ombudsman office was to be the agency's psychotherapist for small businesses ("There, there, everything will be okay . . . if you strike oil under your building"). You may be right. In any event, having an ombudsman gives us a way to give feedback to the agency, and perhaps Neal can work some miracles. I am not especially optimistic, but that's no reflection of my first impressions of Neal. I recommend that you reach out to Neal Cohen in his official capacity and tell him what your concerns are, and ask for his help. Let's hope he finds a magic wand before the CPSC kills us all. Tuesday's election results were a message to your administration. The "shellacking" you experienced was a referendum on your economic policies as well as a passionate call for smaller government. Readers of my blog have heard all about these issues for two years. It is frustrating to me that you and your administration remain in the dark. You weren't listening. My industry, children's products, suffered mightily at the hands of your administration. Admittedly the problem began on Mr. Bush's watch but it was your Democrats who refused to relent or admit their errors. Since passage of the Consumer Product Safety "Improvement" Act in 2008, your party has refused to consider our industry's increasingly pathetic pleas for mercy. The result has been utter market chaos and dramatic financial loss. This regulatory "railroad job" has driven many of us into politics against you and your party out of desperation and profound anger over this undeserved and insensitive treatment. If you take the midterm election results seriously, you must reexamine the impact of this law on our industry and promptly offer sensible relief. The problems with the CPSIA can be divided into four categories - Cost, Complexity, Risk and Intrusion. Please give up the idea that these problems can be overcome with tax relief or some sort of economic incentive. If you break my leg, I won't be able to get up and run like an Olympic champion no matter how many carrots you dangle in front of my nose. It's time to be accountable for the damage that the CPSIA wrought - and then directly address it. Cost: The many ridiculous new rules in the CPSIA dramatically raise the cost of operating our businesses. It goes far beyond the asphyxiating testing costs that the CPSIA imposes. Wasteful administrative costs are skyrocketing in every direction. For instance, tracking labels do not magically appear on our products - we must hire people to redesign each of our products and our manufacturing processes, and we must hire yet more people to make sure we don't screw up these tasks. We sell or manufacture literally thousands of skus (items) - but have had only one tiny recall in the last 26 years. This is PURE UNADULTERATED WASTE. We nevertheless must incur these costs to keep the CPSC happy. These well-documented costs come from somewhere. You may wonder why we're not hiring. [In fact, I have previously disclosed in this space that our head count continues to decline, an uninterrupted trend since 2007 to this very day.] Well, we must fund these unproductive costs from productive activities - sales, marketing, product development - you know, activities that produce new revenue. [Please note: your proposed tax increases will be paid from the same kitty.] Unlike you, we can't solve our money problems by printing more dollar bills - we have to EARN them. If you make us waste our money, we must shrink our business to pay these new costs. WE GIVE UP GROWTH TO PAY THESE WASTEFUL COSTS. I find it exasperating to have to explain this to you. Complexity: We now face perhaps 3,000 pages of new safety rules and laws applicable to our business. I have never included rules on childcare or infant items in this total. For those miserable companies who stubbornly persist in making this kind of item, their total is probably well in excess of 3,000 pages. Each word of those pages is a possible felony. The pre-CPSIA total was about 100 pages of rules, most of which were inapplicable to our business. There was very little to remember - which made it easy for us to administer our business. We could teach the rules, we could remember the rules, we could follow the rules, we could set up sensible priorities oriented around safety (not merely compliance). This is no longer the case. Face it, President Obama, NO ONE understands these new rules. I include the CPSC on that list. There are just too many rules, and they are riddled with inconsistencies, flaws and head scratchers. The rules are also a mess, existing in many forms, in many places, never correlated or conformed, and are certainly not indexed. The rules have no underlying logic, so it is not possible to anticipate how any rule should work or does work - you have to find the rule and study it, preferably with an expensive lawyer helping you. Even finding a particular rule is quite a treasure hunt. We are pretty busy - this does not enhance our productivity. I believe that unless one is a rabbinic scholar or some kind of savant, it is not possible to master 3,000 pages of dense and inconsistent rules. The CPSC has done little to make sense of these rules. Consider the paradox of musical instruments - full-sized musical instruments are not considered "Children's Products" even if marketed EXCLUSIVELY to children. Does that make ANY sense to you? Remember, these are SAFETY rules so if musical instruments are unsafe for some reason, wouldn't logic suggest that we should not let children interact with them? And if they're safe, then they shouldn't be regulated at all. Right? Interestingly, the CPSC says that if you shrink the same instruments down for children, they WOULD BE considered "Children's Products" and subject to the CPSIA, even if marketed side-by-side with slightly larger, full-sized instruments which are not regulated. This makes absolutely no sense, is completely indefensible as public policy and creates a terrible quandary for any business attempting to interpret and apply these rules. The complexity and opacity of the rules outstrips EVERYBODY'S abilities. We are completely stymied - and it's your fault. You and your team refused our advice on how to resolve these issues. Risk: The CPSIA is a tort lawyers' dream. With the coming public database, our industry will be a feeding trough for these vipers. To say the least, you have permitted the government to set up a system DESIGNED to be gamed by lawyers and litigants. How do you think business people will react to this massive expansion of the tort system? Please note that NO ONE contends that there are more injuries to address - it is absolutely clear that the effect of the CPSIA is to create many more claims of action. More cost, more risk - and as a result, there WILL be less economic activity. Add to this misery the current practice of this CPSC to press for recalls that do not meet the CPSA's legal standards for recalls (substantial risk of injury or death) and to impose huge vindictive penalties. The agency is on the war path, trying with all its might to scare us to death. This is an especially powerful economic depressant for small businesses which typically lack the resources to resist these pressures. Small businesses are more conservative and tolerate risk less comfortably as they manage their own money and see themselves as having more to lose than mass market companies or public companies. The aggression of the new CPSC is out of control. The current Chairman likes to BRAG about her big penalties. Trust has been utterly destroyed in the manufacturing community. In two short years, the CPSC squandered its reputation as a partner in safety, someone to be trusted. Who in their right mind would trust this CPSC? If you doubt me, ask McDonald's how they feel about being pressured to recall 12 million acknowledged safe Shrek glasses (and the ensuing media frenzy over cadmium - all without ANY documented injuries from cadmium in children's products EVER). Or ask Schylling Associates or Daiso how they feel about penalties imposed on them for rule violations without any injuries. By all appearances, those penalties reflected regulatory anger, not endangered public safety. Seemingly, almost any violation of these rules can be twisted into a felony charge now. We joke in our office about visiting each other in jail - but it's not really funny at all. I simply cannot fathom conducting my affairs in a way that risks being charged with a felony. As a lawyer, the criminal risk imposed by the CPSIA is completely unacceptable to me and highly offensive. I often say that felonies cannot be committed accidentally - except in the Children's Product industry. The unavoidable accumulation of trivial infractions with heavy penalty risk gives the CPSC winning leverage in any negotiation. The game is FIXED. Everyone knows it, too. This is no stimulus plan, by the way. Intrusion: It's this simple - we have a new partner who showed up two years ago - the U.S. government. They don't know anything about our business and have never run any operation similar to ours but they now reserve the right to check all our work and to second-guess us. Mother May I? That's the new game in our business. Could we live without ANY of this? Yes, most definitely. While the zealots behind this self-destructive law like to emphasize the POSSIBILITY of injury from lead and love to repeat the simple-minded chestnut that there is "no safe level of lead", they FAIL utterly to tie these claims of POSSIBLE injury to data of ACTUAL injury. There is no "nexus". Lead may be "bad" but it has no history of causing injury in children's products. Leaded gasoline, house paint and industrial pollution are the culprits that caused blood lead levels to rise materially - that's undeniably true. Congress missed the boat entirely with the CPSIA - it's all cost, no benefit. Lead injuries from children's products are virtually unknown. My study of CPSC recalls in 1999-2010 totals one death (from a piece of jewelry) and three unverified injuries from lead in 11 years. Given the truly massive size of our industry and the children's marketplace, and the literally trillions of interactions with our industry's products each year, this injury total is statistically equivalent to ZERO. Instead of punishing our industry, you should give us a good citizenship award. We have earned the trust of U.S. consumers. The path forward is clear but frankly, I Still don't think you get it. Trust has been broken. Until you and your administration DEMONSTRATE that you are taking a DIFFERENT path, we will continue to conduct a war against the CPSC and Congress. This defective law deserves a FULL repeal. It is misconceived and has cost countless jobs. I hope you and your associates will not continue to deny the obvious, to fly in the face of data and reason. The voters are on to this scam. They voted many Democrats out of work in midterm elections. If you and your team don't wise up quickly, in the over-regulation of our industry and other industries, they'll vote the rest of you out in two years. The problem was never the law. Before Congress "improved" it, the CPSA was a powerful law that enabled the CPSC to closely supervise children's markets. Let's not forget that the recalls in 2007/8 were conducted under PRIOR law - the unamended CPSA had plenty of teeth. The recalls in 2007/8 were clearly a COMPLIANCE problem, not a problem with the rules themselves. For various reasons, some people weren't following the law closely enough. As objectionable as that may be, it is also important to remember that the 2007/8 recalls were associated with virtually NO injuries. So what should we have done, in lieu of all the tough new standards and venal penalty provisions in the CPSIA? The agency should have been reorganized to work on compliance more effectively. The agency needed to invest in education, outreach to industry and more effective partnership with industry. This idea that we in the business community can't be trusted is revolting and completely untrue - it is a populist idea you and your allies flogged to get elected. If you want to keep your jobs for much longer, you need to drop this caustic idea. We are not bad people or incompetent people - we can be trusted and can be good partners (as our record proves). No, not everyone will be good or conscientious. Bad people and incompetent organizations cannot be legislated away (at a reasonable cost). Still, the data indicates that a lower cost approach of partnership and education will produce very good results. Fixing this law will be a stimulus plan that creates JOBS. Please give us back control of our financial statements and we will find a good way to spend our own money to grow our businesses. We don't need your help - we need you to GET OUT OF THE WAY. Three members retired (Stupak, Gordon and Melancon), three were defeated (Boucher, Hill and Space) and one race is too close to call (McNerney). The composition of the next Congress' House Committee on Energy and Commerce will be all new. 810 days have passed since ANY Democrat in Congress did ANYTHING to help us on the CPSIA. Tuesday is the BIG DAY, guys. We have an opportunity to pay back the perpetrators of the CPSIA in the voting booth. Don't miss this opportunity - it's your right as a citizen, speak out and tell them where you stand. Ideally, make them PAY with their jobs for their refusal to listen. I have thrown my efforts into two Congressional campaigns - Bob Dold running in Illinois' 10th district against Dan Seals, and Joel Pollak running in Illinois' 9th district against CPSIA perpetrator Jan Schakowsky. As you know from this space, I have given up on the process of "dialogue" - no one in the Democratic Party will listen anymore (if they ever did). The next phase is politics. If they won't listen, we will throw them out. Tomorrow is the day we measure what we have achieved. It didn't have to be this way. When Inez Tenenbaum came on board as Chairman of the CPSC, she promised to engage in dialogue and to listen to all stakeholders. As far as I can tell, that was a bald-faced lie. If it wasn't a lie, it turned out to be completely untrue. Sham processes like two-day workshops and comment periods were thrown up as a smoke screen to cover up a scheme to impose draconian regulatory change whether we wanted it or not. Listening isn't this CPSC's forte. Nor is data analysis. With the cram downs evidenced in the final rules on the definition of "Children's Product" and the public database, it is perfectly clear that Ms. Tenenbaum has no interest in views that diverge from hers, whether based on fact or data or reasoning. She's on a mission - and there's hell to pay if you stand in the way. Just look at her penalty record. The next big event at the CPSC is implementation of the final rules on component testing and testing frequency/reasonable testing programs. This is coming SOON - all to ensure that the stay on testing requirements can be lifted in February - you know, so we can all be so damned safe. [Do you have a sense, by the way, that we are UNSAFE today - despite the stay? Oh yeah, that's data and reasoning again. Pah!] When they cram down those rules, your goose is cooked. You've been warned (many times). So tomorrow is your big chance to tell the Democrats that you aren't going to take this anymore. That goes double for the people principally responsible for the CPSIA, like Jan Schakowsky, Henry Waxman, Bobby Seals, Barbara Boxer and other Democratic "luminaries" up for reelection. Here is a list of the members of the House Committee on Energy and Commerce - I hope you will vote AGAINST any and ALL Democrats on this Committee. NONE of them did ANYTHING to help us despite our pathetic pleas for help literally for years. They have PROVEN they don't care - and you need to throw them OUT. People ask me - how can I be so certain that the Republicans will help us? Will they be better than the Democrats, really? Aside from the fact that some Republicans have gone to great lengths to try to help us, taking political risk along the way (something I will never forget), I can say this with CONFIDENCE - I know EXACTLY what to expect from the Democrats. If we don't make a change, we're goners. So the Republicans are my choice and my strong recommendation to you. When they are in power, we'll see what they will do. I am confident, but as voters, we all must remember that the proof is in the pudding. In the meantime, we need to make some serious changes NOW. After the Election winds down, I have a long "to do" list and will publish a number of essays on CPSIA subjects that deserve your attention. In addition, we must engage in dialogue on how to fix the mess Ms. Tenenbaum and Mr. Waxman have created. That's to follow . . . but as for now, you must vote. MAKE THE CPSIA PERPETRATORS PAY WITH THEIR JOBS.